﻿ France - Brittany - Cycling in the Gulf of Morbihan Islands. This independent bike tour will lead you on quiet roads to discover the peninsula and two famous islands : the Moines Island (Monk island) and Arz Island.In Celtic “Morbihan” means “the little sea”. 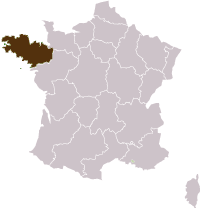 It is scattered with islands and benefits from the mildest climate of Southern Brittany. In the heart of the megalithic region, this is a paradise for sailing boats, fishing and oyster-farmers and ...riding a bike. This Cycling holidays is an enchantment in the islands which are not frequented by cars (except the postman!). Arrive in Vannes, a Roman fortified city with half-timbered houses. From its harbor you will depart to discover the Gulf and its islands. Today's ride takes you around the Rhuys peninsula, St Armel and le Hezo. End your day at the Suscinio Castle, an impressive fortress built at the edge of the ocean, one of the favorite residences of the dukes of Brittany. 35 km. Ride along one of Brittany's majestic peninsulas on the Atlantic side (from Saint James tip, to Saint Gildas de Rhuys) towards the Gulf (le Logeao, Port Brillac, Benance). 35 km. A of discovery riding from town to town on the Sarzeau peninsula. Lovely views on the Gulf and its incredible light reflecting on the ocean. In the afternoon, enjoy a short walk from your hotel on the coastal path. 26km. 4 km walk. Take the boat to Locmariaquer. Megalitic tour with a possible visit of the prehistoric place. Ride to the visit other sites such as Moustoir Chapel or the village of Kerdaniel. Back to Port Navalo. 22km. Boat to the Isle of Moines, called the Pearl of the Gulf. Ride the most beautiful island of the Gulf. Then transfer by boat to the wild Isle of Arz. 19km. Bike the Arz Island called the “Captains Island”, a very quiet and wild place with lovely stone villages. 13km. Back to Vannes, the lovely main city of that region. End of your trip. 875 € per person in double room for a 7 night stay. 915 € per person in double room for a 7 night stay. Price is based upon a minimum of 2 participants. Transfers by local bus transportation (or taxi if a Sunday or a holiday) during the week. 2 and 3 star hotels-Half board- a road book and a map. Access : Vannes train station.